While my first music blog was an mp3-focused affair that admittedly rode the bloghouse wave to a considerable fanbase--when I first moved to New York, it was mind boggling to me that people knew me for These Pops Rock--Future Stock was more of an attempt to jumpstart my music writing career (heh, I know). While I still love writing about music, this was a particular passion project of mine for one winter in 2013 to help develop my abilities as a music writer. Having spent the past year buying an obscene amount of records and seemingly having to get the latest dance 12"'s the week they came out, I soon realized I might as well use this hobby to practice my music writing. And I did. For about three months. Then I got busy with other stuff and the blog languished. But it does contain a few pieces I'm particularly proud of and it was nice to write about some records I genuinely loved, some of which are below. 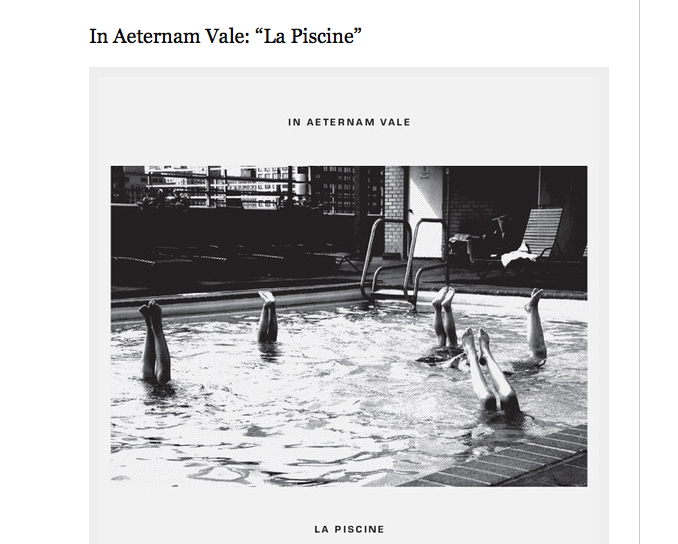 My first review was my first introduction to the batshit world of In Aeternam Vale, whose work runs the gamut from forward-thinking industrial techno workouts to oddball electro pop. For this particular release, the second in a series of spectacular 12"'s released by the always-impressive Minimal Wave imprint, I looked at the artist's particularly prescient techno pieces, proto-industrial thrashings that would fit into pretty much any Bossa Nova set circa 2013. By the time I got to my third review, I was feeling a bit more confident in my writing after the positive feedback I got from friends after the previous two reviews. Turning my attention to the Head Technician himself, Pye Corner Audio presented a particularly salient opportunity to revisit hauntology, Simon Reynold's admirable appropriation of Derrida's concept regarding a nostalgia for an unloved past. To explore the artist's particularly British sensibility regarding electronic music, one that borrowed equally from Boards of Canada as it did John Carpenter, I looked at two releases of his that explored polar opposite directions in his music, the chugging synth works of Black Mill Tapes Vol. 3 and a lo-fi noise excursion on a cassette-only release he did for The Tape Worm called The Ever-Present Hum. Check it here. I've been a fan of both Will Burnett and his label, WT Records, since first going to Dope Jams in 2009 and getting hipped to the label by one of the many helpful, yet cranky clerks. Thus I couldn't resist reviewing his three-part label showdown, boasting a selection of talents who were largely unknown at the time, but in the case of some like Africaine 808, their profile has risen considerably since. All trans are available to stream below.